Just another blog with Blogspot hacks and tips, made/customized by me. By default Blogger shows links to Newer Post, Home, and Older Post at the bottom of a post. There are hacks that add post titles to those links, couple by me, too, here's the latest: Add Post titles to Older and Newer Post links – reloaded. In one comment I was asked if it would be possible to display also thumbnail and post summary. It is. You need to edit your blog's template. I use jQuery in this hack, so you need jQuery. If you already have it loaded, you can leave the first line out of the hack. If you have any previous hack for Newer/Older post links, remove it. Save the template and test. In olderLink and newerLink templates you can use html and fields [title], [date], [datetime], [img], [thumburl], and [summary]. You can also edit the CSS to make everything look different. Hope you like this hack! I started doing this hack after I got a question if it is possible to hide blog posts from home page or not. And it is, with quite easy template modifications. You must have a list of urls to the articles you want to hide from home page. Use the "blogspot.com" domain in the urls, not the local ones (like "blogspot.fi" in Finland). First code hides articles from the home page (yourblog.blogspot.com) and the older posts' pages, when you click "Older posts" on the home page. This is probably the option you want. Second code hides articles just from the home page (yourblog.blogspot.com). If you have three articles you want to hide, make three lines starting with <b:if cond='data:post.url == &quot; (lines 5-6 in the code snippets). Edit your urls carefully to the lines. Hack is installed on this blog, and it is hiding this post http://yabtb.blogspot.com/2013/09/test-post-hidden-from-home-page.html from the home page of this blog. If you have articles published on same date and you wish to hide one of them, you should install my Show date on all Blogger posts within same date, or edit the date of the article to be hidden. 1. Open the tabifying gadget for editing. Make a backup of the working script before making changes. If you have multiple tab sets, and you have tabnav1_tabids instead of tabnav0_tabids, use tabnav1_tabids in the added line, etc. First you have to create a directory in your drive. It can be a subdirectory (of a non-shared directory), for example in the root I have sub directory "Web Hosting" (private dir) which has all the public web hosting directories I have made. After you have created the directory, you can upload files there. When you want to begin hosting those files, select "Share..." for the directory, and under "Who has access" change the directory to be public on the web. 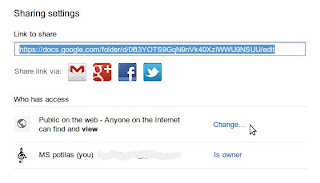 Copy the "Link to share" url from the sharing dialog. You can also use Google Sites to host your files. Google App Engine can be used, too, but that is a bit more compilicated. Don't upload multiple files with same name (like two copies of index.html) under the same directory. Use the "Manage revisions" option. You can use subdirectories under your web hosting directories. Do you have a good tip for Google Drive hosting? Please post it as a comment. Updated the tool to handle the new Google Drive sharing urls. The source code has been updated in the hack's article. I got a question in a comment how to change the thumbnail size in Blogger popular post gadget, in my Trim Blogger popular post snippets right article. Here's how to do it, hack is similar to my previous popular post hacks. In the script there is the variable var newSize = 100; which defines the new size for thumbnails. You can set the new size smaller or bigger than the default size, which is 72. See the tabbed gadgets hack. I am a retired programmer who has multiple sclerosis. In this blog I share some of my Blogger hacks I've made. My nickname MS-potilas means Multiple Sclerosis patient in Finnish. See the recent comment hack. See the top commentators gadget here. Articles from blog feed in chronological order. With Gadget Tabifying Widget your blog's gadgets can be turned into tabs to save vertical space.